We offer condolences to Firefighter-EMT Marshall Murdaugh and his family on the death of Marshall’s Grandmother Betty Crosby who passed away this weekend. Funeral Services will be conducted by Peeples-Rhoden Funeral Home in Hampton. Visitation will be held Tuesday evening from 18:00 to 20:00 at the funeral home located at 300 Mulberry Street West, Hampton SC. A grave side service will be held at Rivers Cemetery Wednesday morning at 11:00. Please remember his family in your prayers. Three people died, including a child, after being struck by a car on I-95 near the 57 mile marker northbound Wednesday 23-December. While units were responding to another fatal MVC near the 64 mile marker, they passed a single car MVC in the median just north of Exit 57. 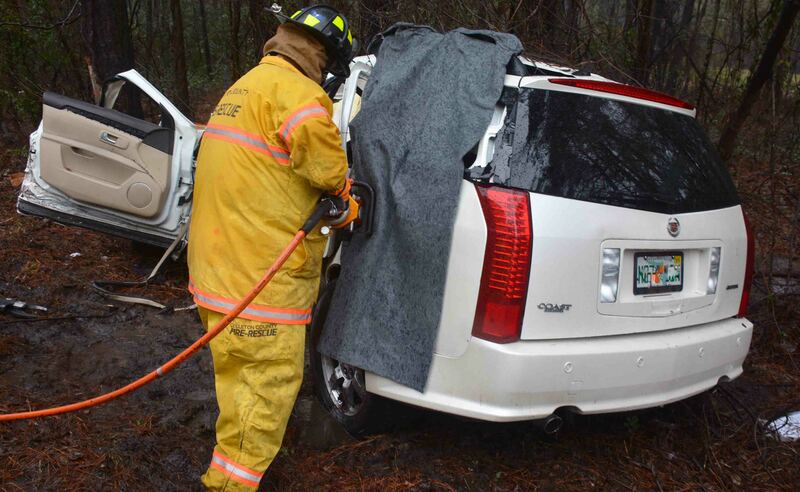 The small car had left the roadway in heavy rains and struck a tree, causing minor damage. Click here for more information. A 28 year old woman died from injuries received in a high speed MVC on I-95 near the 64 mile marker northbound, Wednesday 23-December. 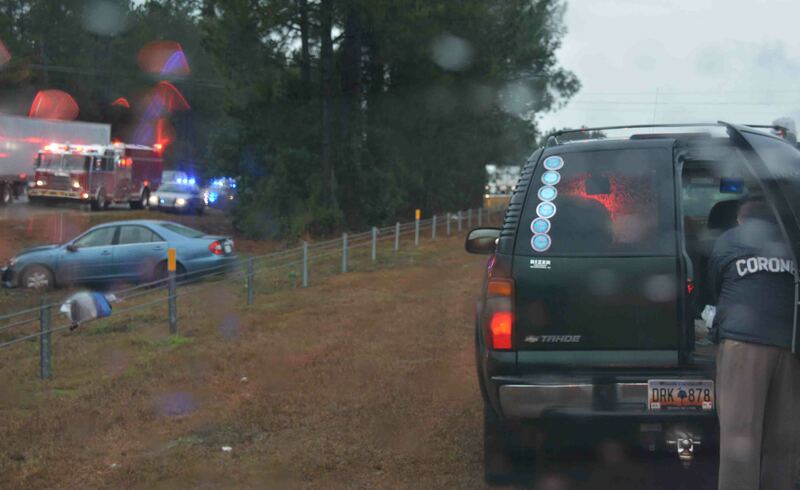 At 12:27, 9-1-1 Dispatchers received multiple reports of a SUV that struck several trees. The callers advised two people were trapped in the wreckage. Engine 26 arrived several minutes later to find the Cadillac SUV in the median with heavy damage. Click here for more information. A 20 year old male received a single, non-life threatening GSW to the leg Wednesday morning 23-December. 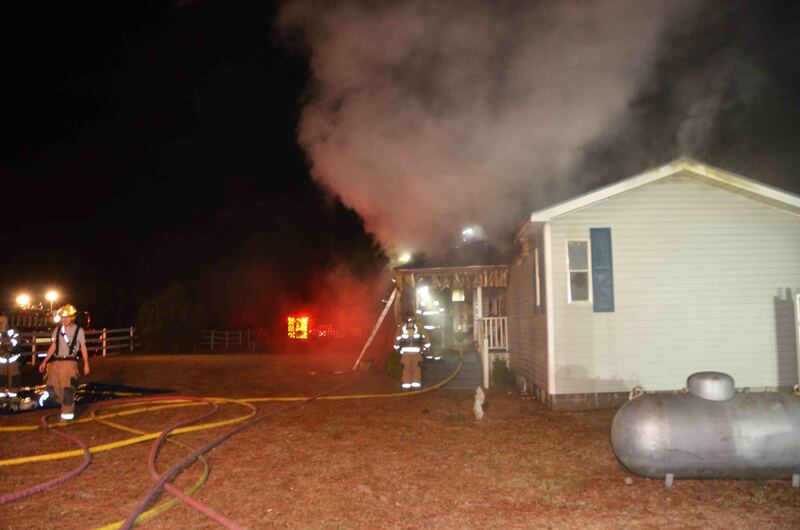 The incident was dispatched at 00:20 at 1465 Koth Street, east of Walterboro. 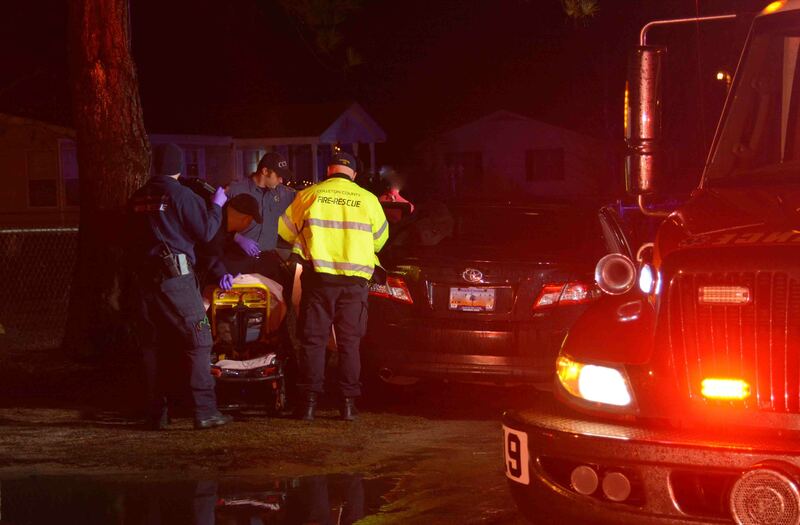 Sheriff’s Deputies first cleared the scene before Firefighter-Paramedics arrived. 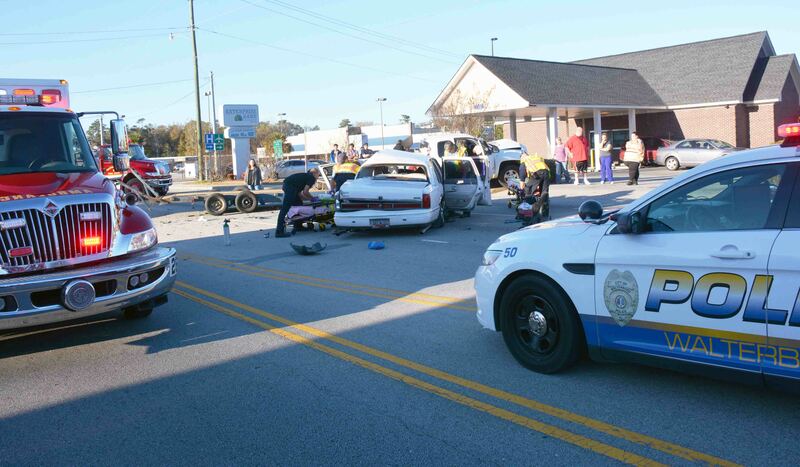 Medic 19 treated the man at the scene, then transported him to Colleton Medical Center. Click here for more information. A 20 year old man was critically injured in a single vehicle MVC near the 13000 block of Bennetts Point Road, Saturday morning 20-December. 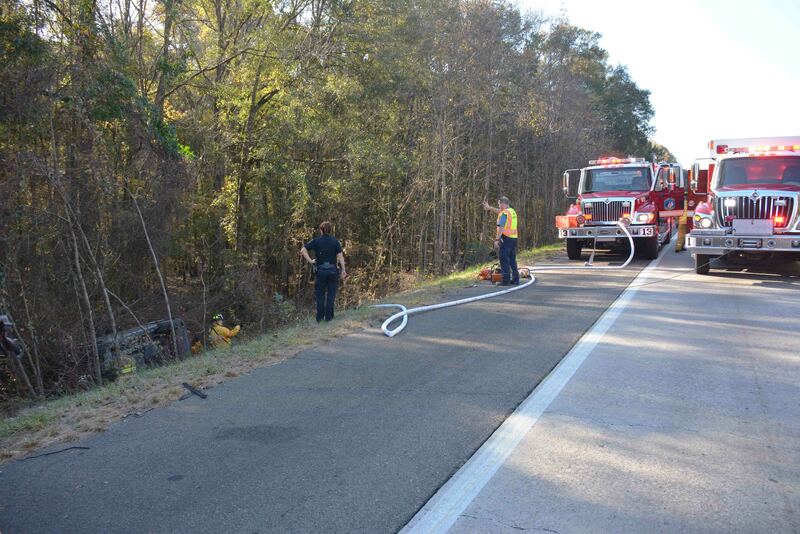 The accident was reported at 06:16 when a motorist drove up on the vehicle in the roadway. Apparently the southbound pickup truck struck a deer in a curve, then lost control, left the roadway and hit several trees. Click here for more information. 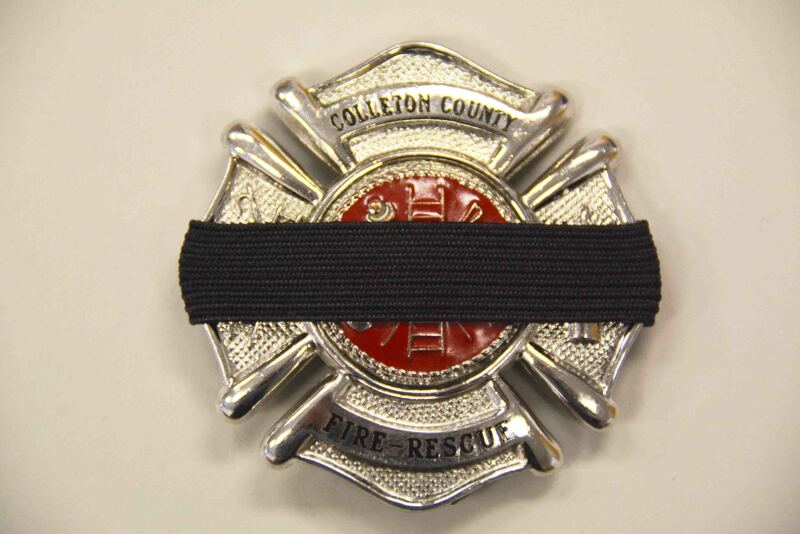 We offer condolences to Firefighter-Paramedic Jason Lightner and his family. Jason’s father, Dwight W. Lightner, passed away Thursday 18-December. Mr. Lightner was a veteran of the Vietnam War. Funeral services will be conducted at 11:00, Saturday 20-December at Sugar Grove United Methodist Church, 324 East Street, Sugar Grove, Ohio 43155. Please remember their family in your prayers. 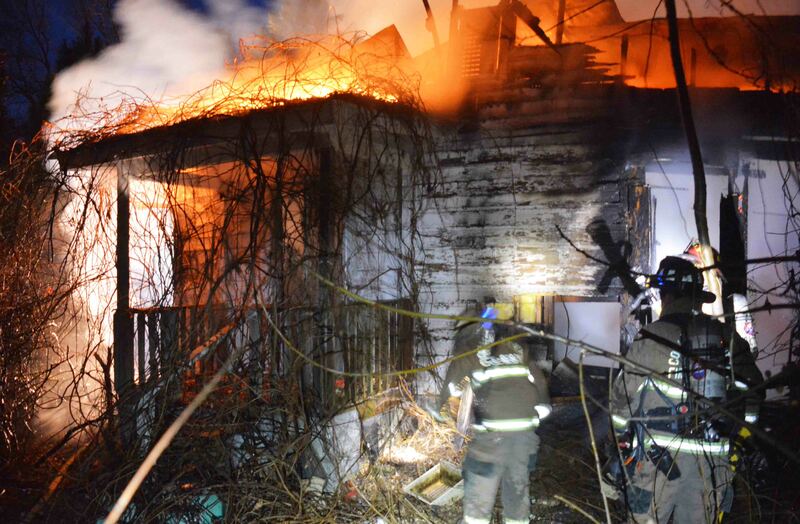 A vacant residence in the 4000 block of Wiggins Road was destroyed in an evening fire Wednesday 17-December. The initial call was received at 17:07. Engine 6 arrived the find the single story wood frame structure approximately 70% involved. The home is located in a remote rural area. Firefighter-Paramedics deployed multiple handlines to combat the fire. Click here for more information. Four people were injured, one critically, following a two car collision in the 800 block of Bells Hwy just east of Robertson Blvd. At 15:42, a car pulled out of Briarwood Road into the path of an east bound pickup truck. The truck collided with the car in the driver’s door. Both vehicles received heavy damage and block Bells Hwy. Click here for more information. At 06:45, Saturday morning 13-December, seven members of Fire-Rescue participated with a dozen other emergency responders and Colleton County DSS to bring a brighter Christmas to some children in our community. 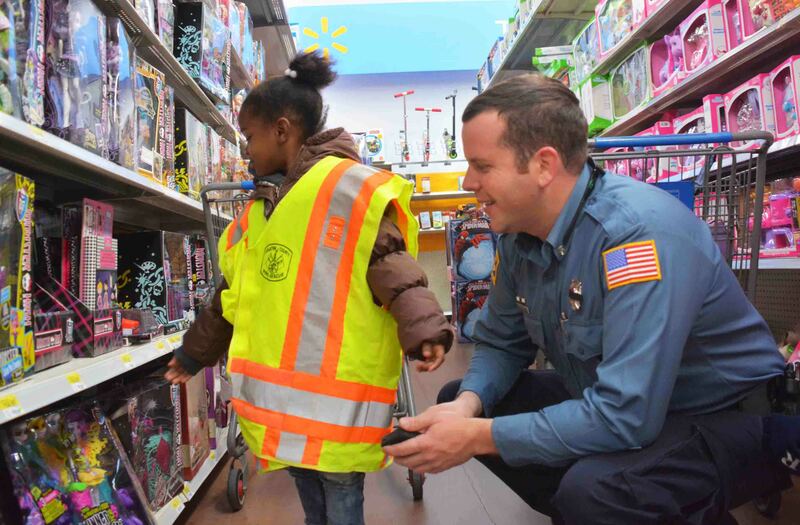 The annual “Shop with Santa’s Heroes” event is sponsored by the Walterboro Police Department who spearheads the collection of donations to purchase the gifts for the children. Click here for more information. The funeral arrangements for Firefighter/Deputy Coroner Isaac Lavine will be handled by the Allen Funeral Home. Visitation will be held Friday evening 12-December at the Funeral Home located at 1905 Charleston Highway, from 17:00 to 19:00. Funeral services will be conducted at the New Life United Methodist Church, 763 Green Pond Highway, Saturday morning 13-December at 11:00. We offer condolences to the family of Firefighter and Deputy Coroner Isaac Levine who passed away this morning. Mr. Levine was working for the Coroner’s Office returning from MUSC when the Coroner’s Van left the roadway and struck a tree a little after 04:00 this morning. He died at the scene from his injuries. Click here for more information. 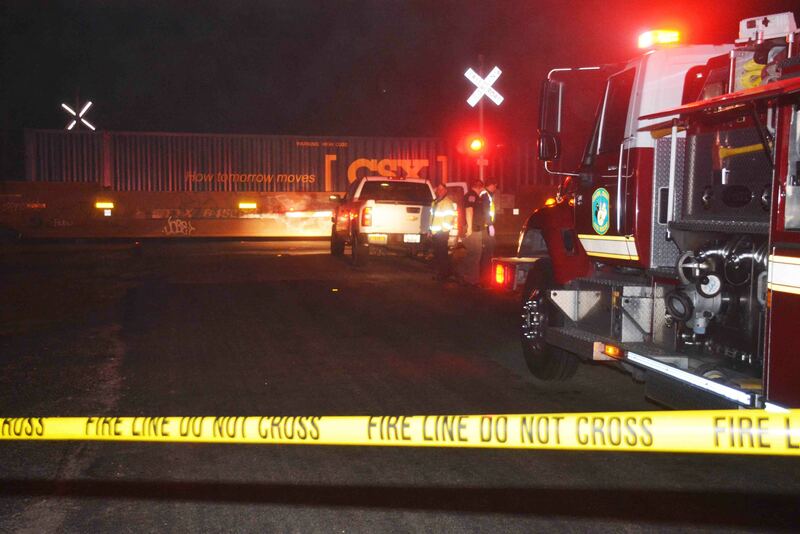 An adult male was killed Wednesday morning 03-December after he was struck by a CSX freight train at approximately 04:02 on Public Landing Lane. Witnesses advised the man got out of a pickup truck at the marked crossing and was attempting to touch the passing train when he was struck. The crossing arms and warning lights were functioning properly. Click here for more information. A home located at 601 Enoch Road was heavily damaged by an electrical fire Tuesday evening 02-December. The incident was reported at 17:40 when the family smelled smoke in the home. Upon investigating the smell, they found smoke at the ceiling level of the master bedroom and called 9-1-1. Engine 31 arrived minutes later to find heavy smoke conditions and flames visible from a window at the front of the residence. Click here for more information. Three New Yorkers and a large canine were trapped in a minivan after if left the highway and flipped on its side Tuesday morning 02-December. At 09:23, several callers reported the accident to 9-1-1. 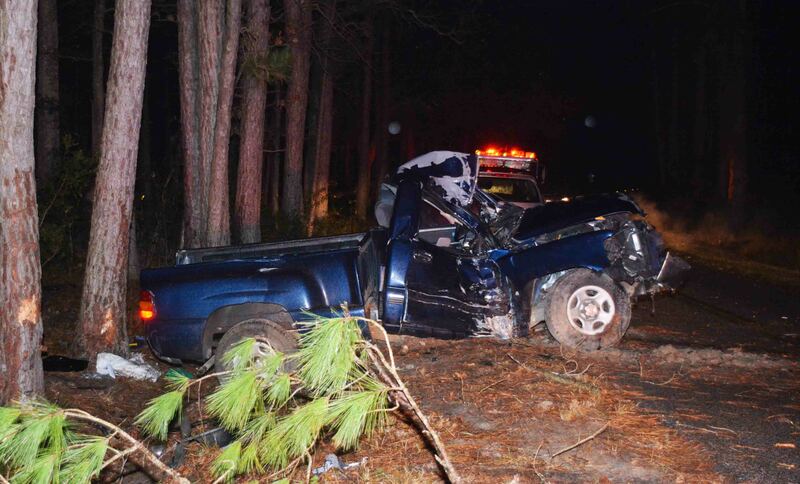 The northbound Honda mini-van left the roadway at a high rate of speed near the 40 mile marker at the Colleton-Hampton County line. Click here for more information. 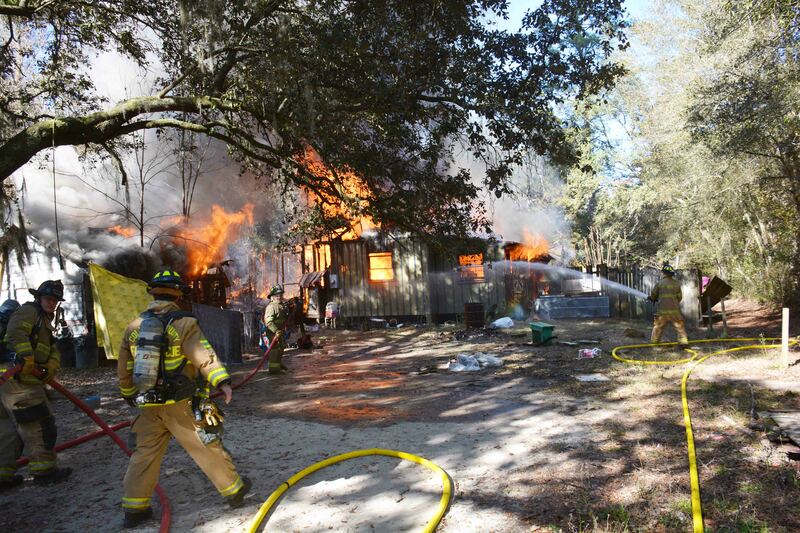 A home and detached garage at 505 Meeting House Lane were destroyed in an afternoon fire Monday 01-December. At 12:53, Fire-Rescue was notified of a possible electrical fire at this location. Engine 36 arrived 9 minutes later to find the one story wood frame dwelling and a detached garage well involved. Click here for more information.